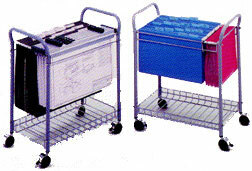 Accommodates 18" hanging clamps, 18" x 14" folders or letters and legal size folders. Only 24 1/2" high tucks neatly under most work surfaces. Bottom basket for additional storage. Light gray tubular steel frame with chrome wire supports. Includes four swivel castres (2 locking). Overall Dimensions: 21 1/2" W x 13" D x 24 1/2" H.